And welcome to my newsletter for February, 2015! Please feel free to forward this to anyone whom you believe might be interested in keeping up with me! To receive these newsletters regularly, drop me an email or subscribe online from my website (http://www.JefMurray.com ) or at: http://groups.google.com/group/Mystical_Realms . • I’ve added 2 new painting images to my website at www.JefMurray.com . These include The Wizard’s Tale, and The Ring Goes South. The first of these can be found in my Fairy Tales gallery; the second can be found in my Middle-earth -> The Third Age -> Lord of the Rings gallery. You can also find them all by going directly to http://www.JefMurray.com and clicking on the “Newest Works->Paintings” link at the top, left. • In addition to the above, I’ve added 8 new sketch images to my website. These can be found in the Middle-earth Sketches, Narnia Sketches, Fairy Tale Sketches, and Soul & Spirit Sketches galleries, or you can see them all by clicking on the “Newest Works->Sketches link at the top left of my website. Sam stirred ever so slightly from his sleep. At first he thought it was a bird, but then he remembered: it was pitch black outside, and other than owls, no birds should be stirring. He sat up in bed. Sam looked around but saw nothing out of the ordinary. He noticed the faint electric glow of starlight streaming through the windowpanes onto the wooden floorboards. But there was something else there as well: something blocking the light. He couldn’t tell what it could be. Sam rubbed his eyes. He flung aside the covers, pushed himself out of bed, and stepped toward the pool of starlight on the floor. As he approached the window, he saw a figure huddled just outside among the bushes: a dark silhouette. He knew the voice, but he hadn’t heard it for quite a while. Was it his cousin? Sam lived with his Uncle Charles. They shared the house in which his uncle had resided for decades. It was the house with the strange and ancient chest in the attic, the one filled with magical artifacts. The chest had been entrusted to his uncle by someone else, many years before Sam had been born. Sam had borrowed something from the chest once: a book filled with the most amazing stories. He had read it all night long. But the next morning, when he awoke, the book had vanished. It had returned, of its own accord, to the chest. That had been Sam’s first experience of magic: real magic. Now he squinted into the darkness. It was an April morning and it had been unusually warm, but there was no warmth near the window. In fact, he thought he saw frost at the edges of the panes. But just a few inches beyond the glass, Sam could make out a pale face with eyes that reflected the light from the stars in an odd way: a spooky way. The face appeared to be that of his older cousin; yet it was not his cousin. His cousin was overseas, he remembered. He was staying in the home of friends in Italy, where he was studying the writings of the desert fathers. 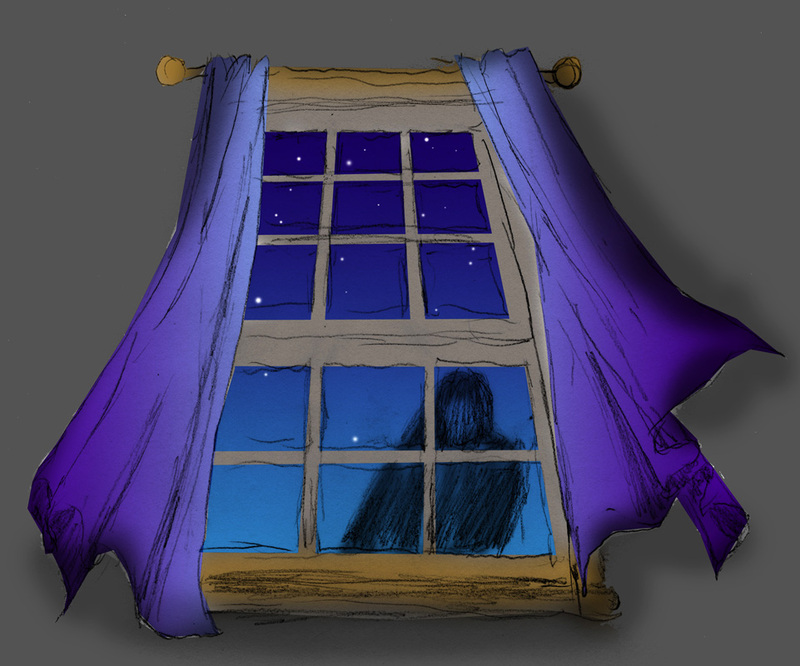 “Come on, Sam, let me in…,” whined the voice once more, and the creature continued its eerie tapping upon the windowpane, with fingernails that looked more and more to Sam like claws…. .He shook his head to clear it and then looked around at his bedroom. His eyes came to rest upon a small icon of St. Michael the Archangel on his bedside table. It had been given him by Father Hildebrandt when they had first. Father Hildebrandt had looked deeply into Sam’s eyes, and had then stepped to the wall beside his desk, on which had hung this icon. He had removed it and handed it to Sam. “This may come in handy someday,” the Abbot had told him. As Sam continued the prayer, the tapping upon the windowpane slowed and then ceased. Soon he thought he could detect the faintest sweet scent in the air around him. What was that? Frankincense? He completed his prayer and looked once more, with trepidation, toward the window. But there was no longer any figure huddled outside. Instead, the faintest blush of dawn was showing upon the horizon. Whatever creature had assailed him during these darkest hours of the early dawn had been vanquished. Sam, grateful that he had been spared any greater trial, returned to his bed, and he fell into the deepest and most untroubled sleep he could ever recall having had in all of his tender years….